This is a tremendous soft rope and is great to use in necklaces or bracelets alone or as a base for any other project. You could also use it along with a dutch spiral or other strap or on each side of a center piece. Short lengths make wonderfully soft earrings. Make your spiral rope chain the length you wish for either a necklace or a bracelet. Mine was 7 � inches long for this bracelet. You will then begin at one end and anchor thread. Insert needle in first set of 3 outer beads and pass it through. Add 5 seed beads then one accent bead and then 5 seed beads. (see diagram below). Insert needle right next to where your needle just came out into the second row of outer 3 beads. Pass it through these beads and again add 5 seed bead then one accent bead and 5 more seed beads. 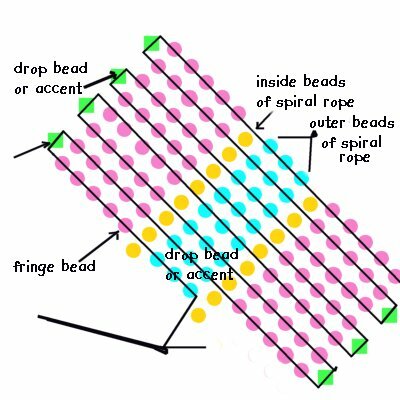 Again move over one outer row of 3 seed beads and continue this process. All material, designs and content of this web site are � copyright of Pat Gibson for "Serenity by Design" and may not be copied unless indicated as "free to copy" or otherwise credited to other services as indicated by links to graphic sites.